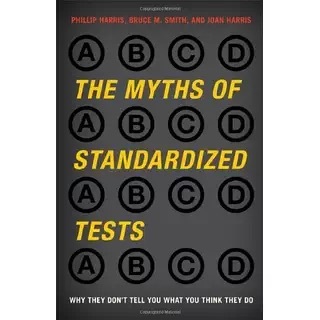 I’m still on the road, so today you get a shortened summary of The Myths of Standardized Tests: Why They Don’t Tell You What You Think They Do by Phillip Harris, Bruce M. Smith, and Joan Harris. If you agree with me that the current state tests imposed by the federal government are harmful to students and teachers, you will find ammunition here to help me fight this battle. If you want the longer summary, click here. The tests rely on items closely linked to socioeconomic status and inherited aptitudes to spread out the scores. As such they tend to measure what students bring to school, rather than what they are taught once they get there. Just Pass or Just Fail? Any student can go from proficient on one version to needing remediation on another. Items are chosen to spread out the scores of the test takers. Time limits spread out scores even more. As students can only sit and focus for so long, the tests can only deal with a small fraction of the domain. Some topics have to be skipped. Timed tests also produce test anxiety. Who Wants to be Judged by a Snapshot? Tests depend on the idea that a small portion of a student’s behavior fairly represents the whole range of possible behavior. To draw valid inferences from a test, it must cover more than a small part of the content domain. They don’t measure goals schools pursue like creativity, critical thinking, motivation, persistence, empathy, leadership, courage, compassion, honesty, and curiosity. Students with high scores may be shallow thinkers. Important items that all students should know are left out at the expense of items that half of the students will miss. There are too many standards to use criterion-referenced tests. A look at how the tests are made reveals a good deal of subjective human judgement from the people who write, edit, and assemble the test items. Setting the standards also requires judgement that occurs in a political and social context. Achievement levels are, first and foremost, policy statements. There is excessive reliance on rewards and punishments. Research shows how rewards dampen interest in, and enthusiasm for, the activity that is rewarded. “The more any quantitative social indicator is used for social decision-making, the more subject it will be to corruption pressures, and the more apt it will be to distort and corrupt the social processes it was intended to monitor. 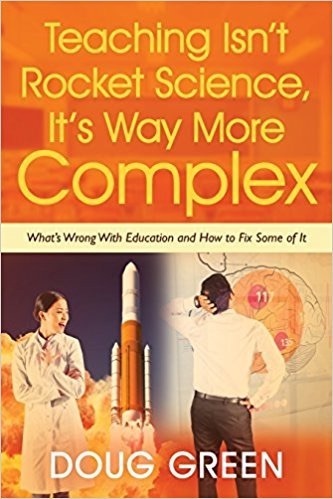 High-stakes tests have narrowed and dumbed down curricula and eliminated time spent on untested subjects by about a third, including recess. Tests also drive instruction towards items with one clear, right answer at the expense of open-ended problem solving. Nonacademic accomplishments are better predictors for future accomplishments than grades or test scores. Grades are much better predictors than tests since they often consider more qualities than test scores. The best predictors of future accomplishment are similar accomplishments. We expect everyone to learn the same things, to the same level, at the same time? What is the point when everyone is unique? Our obsessive focus on academic achievement measured by tests has pushed other goals to the back of the bus. This entry was posted on Wednesday, September 7th, 2016 at 5:30 am	and is filed under Book Summaries, Education Books. You can follow any responses to this entry through the RSS 2.0 feed. You can leave a response, or trackback from your own site.